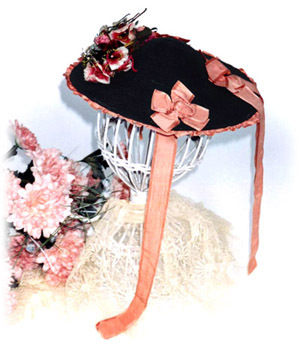 Featured is a finely woven black straw circular bonnet without a brim or crown. 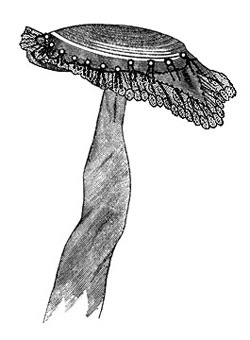 The ladies hat dates from circa 1866-68. The hat’s outer edge is adorned with ruched 1-1/4 inch wide pink silk ribbon while the slightly curved top is decorated with a large cluster of pink and white flowers and three pink silk bows. The back bow has long ribbon streamers and there are two pink ribbon ties. 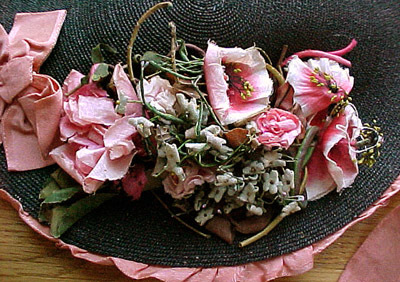 This photo details the pink flowers and leaves that garland the top of the Victorian hat. 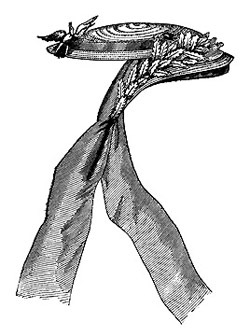 Above are examples of two similar styles of 1860s bonnets without a structured crown featured in an 1867 issue of Harper's Bazaar, a women's fashion periodical. 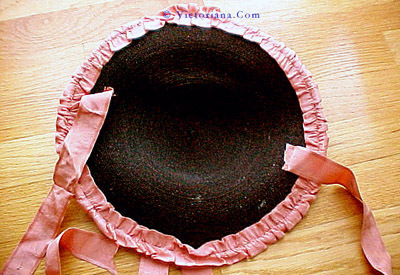 This photo illustrates the underside of the hat and the silk ribbon ruching bordering the black straw.